Symbol: The omniscient witness (camera). For 118 days Maziar Bahari was confined to Evin Prison, Iran under the suspicion of being an American spy. Maziar’s only crime was that of bearing witness. What is interesting to notice throughout this film is use of deprivation as means of torture, and yet the film is centered around disclosure; the necessity to capture events and the consequences that follow. Early in the movie we see Maziar’s mother being asked to put on her scarf when Iranian officials come to question and inevitably arrest take away her son. As a woman, she must conceal herself. Maziar returns to his native country of Iran to cover the 2009 election. He befriends a passionate group of men in favor of Mir-Hossein Mousavi for the upcoming presidential election. These men are not afraid to have Maziar film their activities, including an entire rooftop housing illegally attained satellite dishes, used for the purpose of accessing international media. Maziar self censors when he turns the camera off upon the reveal of this ‘Dish University’ and later explains that it does not do his friends or the movement any good to film certain situations. The web camera is used to give Maziar a chance to communicate with his wife and see the growing development of his unborn child. In addition, previously filmed home video of his wife is used as a devise of torture, reminding Maziar of what he could be loosing is he did not confess to the charges brought upon him. This moves the camera from a tool for hope and happiness to one of despair and torment. When Mahmoud Ahmadinejad is announced as the newly re-elected president, supporters of the opposing candidate Mousavi feel their votes were not included prompting mass protests on the streets of Tehran. In the commotion of the protests Maziar’s colleague tells him to use his camera. He’s angered that Maziar has the real weapon and refuses to use it, This has to be seen, exclaims the friend. Here is the pivotal moment when mass violence and murderous retaliation is captured on video. States that he has a real weapon, his camera, and is choosing not to use it. When he does, there is consequence. Corruption can no longer hide as a record of evidence is constantly kept through video, later shared through social media accessible to people all over the world. Mazair’s punishment for seeing is being blinded. From his wife and mother, from seeing the outside world. That which he was trying to reveal has been closed off to him until he provides a (false) confession for being an American spy. It is revealed that every movement since Maziar arrived in Iran was captured and his colleagues met along the way were implicated as saboteurs of Iran and its ‘supreme leader’. Day 71 Maziar looses his resolve and agrees to be is filmed on national television to be made an example of and apologizes for attempting to infiltrate the Iranian people and make them look unfavorable as part of western-agenda led propaganda. 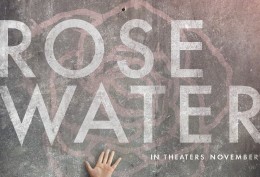 The movie Rosewater gives its audience insight into the great power and possible consequence which accompanies the omnipresent narrator. For after Maziars confession, nothing has changed, there is still violence and unrest on the streets of Tehran. On day 117 Maziar is seen dancing with great jubilation through the jails surveillance footage. He has regained hope with the news htat his story is being heard across the world, thanks to his diligent wife. Day 118, Maziar is on a plane back to London where he will be re-united with his wive only days before she gives birth to their first child. The passenger next to him place a blind fold on, in an attempt to relax during the non-stop flight. Maziar smiles, and it can be assumed with this gesture that he will never again turn away or blind himself as he has gained an appreciation for his ability to always see the truth. The final shot of the film is Dish University, Iranian police are destroying all of the satellites as a young boy hides in the shadows and records their aggressive action through a mobile phone. Proving once more, the immense power of the camera.